We made it up to the Bellingham Farmer’s Market last weekend, always a welcome activity when spring is making itself felt but our local market won’t open for weeks yet. We placed an order for half a cow from Skagit Angus Beef, bought an astonishing quantity of leafy greens, two chunks of goat feta and some fresh, purple-tipped asparagus, then swung by the Bellingham Pasta Company’s table and picked up a pound each of lemon pepper linguine and nettle fettuccine. I love fresh pasta, but seldom make it myself (perhaps because it often turns into a drama-filled production complete with tears and recriminations), so it’s always fun to have some different noodles in the house. 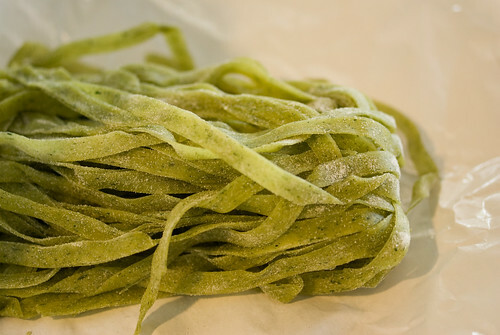 The nettle pasta we used immediately for lunch. One of my standby there’s-nothing-in-the-house-to-eat meals is pasta with canned tuna, capers, olives, chile pepper, and tomato. There are endless variations depending on what’s in the pantry, and it’s always good. 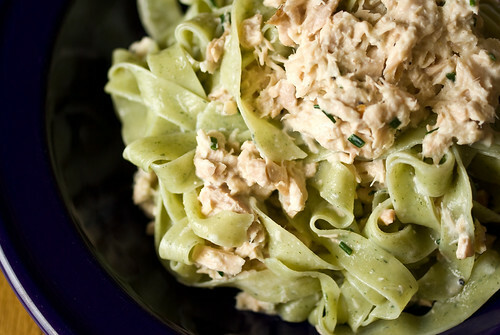 I wanted to use tuna with the nettle pasta, but this time I didn’t want such a pungent sauce, for fear it would overwhelm the delicate green flavor. 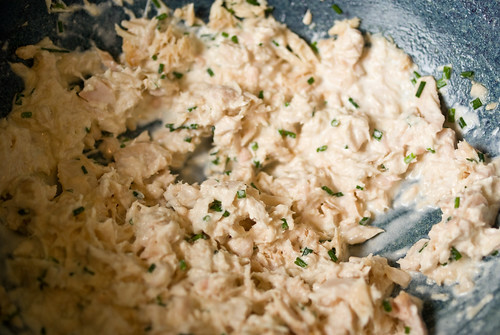 After a quick consultation with a few cookbooks, I tossed together a sauce of mashed tuna (the really good locally-packed albacore from Island Trollers) mixed with raw garlic, fresh chives from the garden, and a splash of cream to moisten it. The noodles, after their three minutes in the boiling water, went into the bowl with the uncooked sauce, and I swirled it all together. It was delicious – light, garlic-scented, but still highlighting the fresh noodles. One of my better ideas.